When we got there today, no bird was in sight! No parents on their usual lookouts; no ledglings we could see. After scouring every nook and cranny as well as possible from the ground with binocs, we drove till we found a street and a spot where from a great distance we could see the very back of the CT complex. Nothing. Before giving up, we went back to the tower and a couple of the kids had woken up and came out of their excellent hiding places! This is the little one with the yellow tape who had been rescued Monday after winding up down in this debris-filled well four stories below ground level. It is under the 12th floor nestbox, shown below, which means she fell about sixteen stories to this well covered with broken beer bottles, wire and filth. This little pefa did not have an official name after the banding and Connie let me know she wanted to name it Sage. I am honored to have this little Peregrine bear the name. 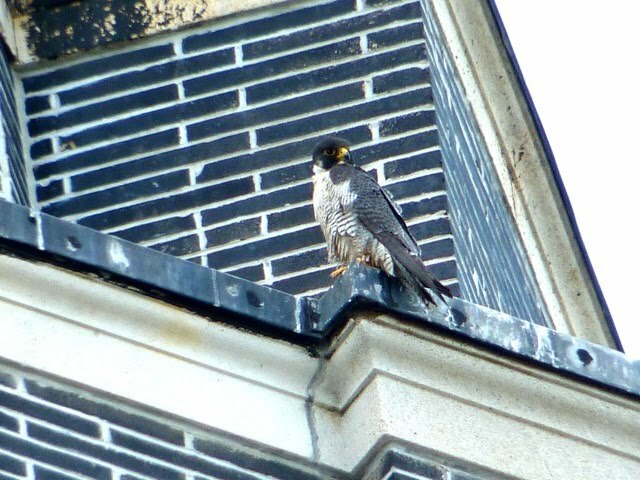 Stash, Jr. has actually fledged, at least to the adjoining roofs six stories below the nestbox. He had been crawling along the roof edges and snuggling up with another ledgling to sleep on the ledge under the arched roof. Today found him back on the nestbox ledge with his little sister, and sometimes there were three or four there! Although one parent came back and gave flying demos both were gone much of the time, hopefully with the fledges! 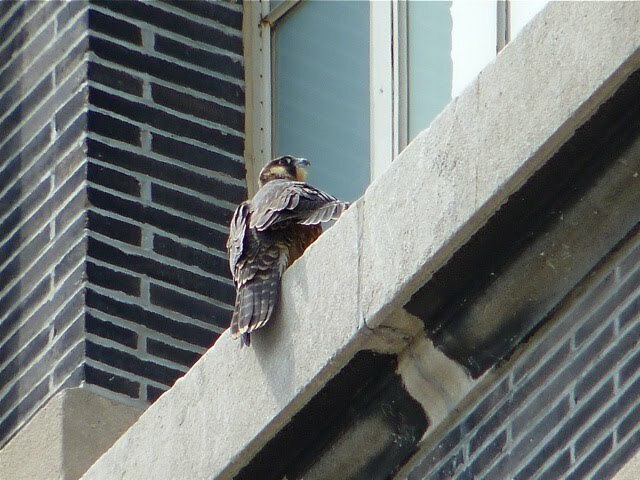 Central Terminal really is Peregrine Palace, with many architectural ledges, points, flat and arched roofs, with plenty of room for even this brood of five. And this is good because unlike UB or the Statler, the larger area is devoid of any other tall buildings which could serve as training grounds for landings and take-offs. One of the homesick fledglings and BB?